Morris James is pleased to announce that Nikai Morales was recognized as the Boys & Girls Clubs of Delaware’s 2017 State Youth of the Year. Youth of the Year is the Club’s premier recognition program and recognizes a Club Member’s leadership, service, academic excellence and dedication to live a healthy lifestyle. 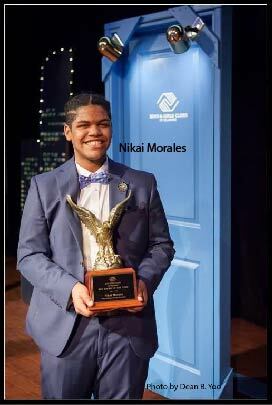 As a result of Nikai’s achievement, he will receive a $5,000.00 scholarship for college and represent Delaware at the Northeast regional competition to compete fo...r the title of Boys & Girls Clubs of America’s National Youth of the Year. The National Youth of the Year will receive an additional $25,000 scholarship, renewable each year up to $100,000 and will have the opportunity to meet with the President of the United States in the White House. Michael Owen is a Boys & Girls Clubs, Greater Wilmington Board Member and former Youth of the Year Judge (2015, 2016).